Mid Coast Hospital Auxiliary members helping with intake at the Grand and Glorious Yard Sale to be held May 18–20 at Merrymeeting Plaza in Brunswick. This year's Mid Coast Hospital Auxiliary Grand and Glorious Yard Sale will take place May 18, 19, and 20 at Merrymeeting Plaza in Brunswick. 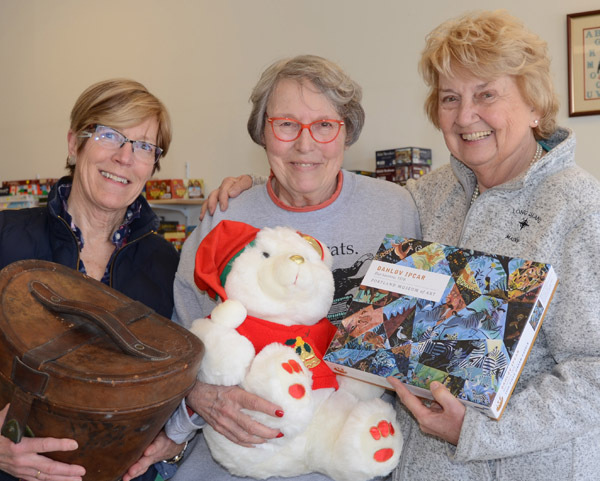 Presented as a suite of boutiques, three stores are full of new and gently used, donated merchandise including furniture, toys, linens, jewelry, and housewares. "Each year we are overwhelmed by the community's support of this popular event," said Joyce Morgan, President of the Mid Coast Hospital Auxiliary. "From the generous donations to the dedicated volunteers who work tirelessly to set-up the merchandise for display. This year we received donations from entire estates, all of which has been assembled for premier viewing." The Auxiliary will hold a special Preview Party on Friday, May 18, 6:00 p.m. to 8:30 p.m. when community members can attend and purchase in advance of the public sale. Preview Party tickets, $20, are available at Mid Coast Hospital's Gift Shop, Gulf of Maine Books in Brunswick, and Now You’re Cooking in Bath. Tickets will be sold at the event for $25. The Yard Sale will be free and open to the public on Saturday, May 19, 9 a.m. to 3 p.m. and Sunday, May 20, 9 a.m. to noon. All proceeds benefit Mid Coast Hospital projects and Health Career Scholarships for local students graduating in a health related field. "The event is entirely run by hardworking volunteers and dedicated Auxilians who whole-heartedly support the mission of Mid Coast Hospital to care for the health of this community," said Morgan. "We look forward to seeing the hundreds of attendees who travel far and wide for this popular event. This year, we anticipate our biggest turnout yet!"